Now young travelers in second grade or above do not need an airplane, train, or even a car to explore the enchanting state of Florida. They simply open the book, Celebrating Florida, to read aloud and learn about the wild life, including alligators and crocodiles and a fact that people may not know. They find out how people travel in swamps and where they must go to find sponges. This adventure even takes them to the beaches to make a sand sculpture or learn what a sand dollar looks like as they improve their reading skills. Don’t stop here! In the back of the book, they discover more facts like the state capital and important dates in history. Colorful, and sometimes dramatic, illustrations provide a more in depth approach to seeing what someone can behold. For instance most people know about the orange trees, but what about grapefruits and strawberries. The state flower, orange blossoms, smells sweet, while the state animal, the panther, can be terrifying. Skip over to page 34 and find reading activities that extend the facts so they can be shared with others. Even though it has a glossary in the back, it would have helped to add accent marks to help sound out the unusual vocabulary words such as Seminole or Tobocaga. Due to the target 2nd grade reading level, the character, Mr. Geo may have been more effective as someone closer to their age instead of someone closer to their parent’s age. 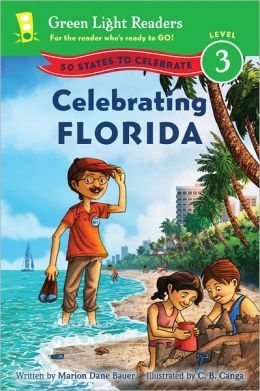 The book is part of the “50 States to Celebrate” series.